You can't tell it from looking at my blog, but I have been stamping a lot lately. Only one problem, I can't share anything I have been doing because it is for an upcoming Spring event. So I decided to take a look through the catalog and see if there was anything that would inspire me for a quick card to share here. I found it on page 119. That is one of the many things I love about the catalog...the samples. 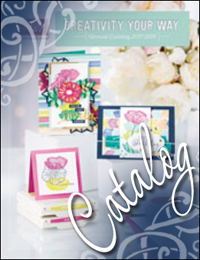 There are about 300 ideas in the current catalog. I say "about" because I think I counted about ten of the samples twice. LOL! I did make some changes to this already adorable little 3"x3" note card, but there is no denying that this is a case. I started with a Pretty in Pink note card and stamped flowers from the Bordering on Romance set with VersaMark ink and then heat embossed in Whisper White. I tied on a little bow with ribbon from the Sycamore Street Ribbon & Button pack from Sale-a-bration. The sentiment is from the Delightful Dozen set. I used Island Indigo and Raspberry Ripple markers to color the words and omitted the heart. Then I punched it out with the Decorative Label punch. The butterfly was made using Twitterpated DSP and the Elegant Butterfly punch. I added a small flower made with the Itty Bittly Shapes Punch Pack and then added a small pearl to the center. I will continue to try to have something to share at least a couple of times each week, so don't give up on me. See you soon! Where o' Where is "That Tape Gun"? I have recently received some inquires on where to find the tape gun that I used in my recent video. If you go to www.TheTapeDepot.com and type "tape dispenser" in the search window it will take you to a link for the tape gun. You can also just click here and it will take you directly to the page. Another question I have received is which tape? I use the Reverse Wound Transfer ATG-7502 1/4" - 6 mm - 144. If you are a scrapbooker, you may prefer a wider tape...it really is just a personal preference. Even better, purchase two tape dispensers and load them with two different widths of tape! I received a phone call from The Tape Depot! I can't believe it...I just received a phone call from the managing partner of The Tape Depot. WOW, I feel like a celebrity! He said that the video that I recently filmed about the ATG-50 tape gun has had a dramatic effect on their customer service. They are referring several customers to the video on a daily basis. I never dreamed that one little video would have such an amazing impact! If you would like, you can see the video here. We talked for several minutes and I hope to be able to do more product videos for them in the future. BTW, I did the video completely as a service to all you wonderful stamping/crafting friends out there! My BFF, Nancy Brown, gave me this great tape gun from The Tape Depot for Christmas...only one problem, neither of us could figure out how to correctly load the thing. We tried everything, but just when we thought we had it figured out the tape would become all messed up and for the most part, we just gave up trying. Then the other day Nancy and I sat down to try to determine just exactly what we were doing wrong. We loaded and reloaded. We looked online for a tutorial without any real success. We quickly discovered that other people who had purchased this particular tape gun were having similar problems...so we set out to solve the mystery and then share it with all of you. Here's a tutorial on how to load your AGT-50 tape dispenser from The Tape Depot. Remember, you can click on any image with your mouse and the image will enlarge. We definitely aren't experts on this, so we take no responsibility for any damage which may occur while loading your tape gun. Here is a step-by-step photo tutorial. I hope to have a video tutorial soon! First, use the latch at the bottom of the gun to open the casing. Lay the gun on a flat surface and open the hinged cover. Load the tape onto the larger front mechanism in a clockwise motion. Make sure the the tape roll is pressed down as close to the gear mechanism as possible, being careful not to break anything. You may need to turn the tape roll in order to get it to go all the way down. You shouldn't need to force it! Hold the trigger down and gently pull the tape over the larger roller and then down under the smaller smooth roller and back over the top of the tape. Make sure there isn't any slack in the tape. At this point you can release the trigger. Make sure to give yourself a little extra tape to work with. Continue to roll the tape under the second "take up" mechanism in a counter clockwise motion by weaving the end of the tape in and back out of the the grooves. You can turn the smaller black take-up wheel if necessary. Trim any excess tape. Use the inner silver tension wheel to adjust the tension if necessary by turning it either clockwise (to tighten) or counter clockwise (to loosen). The factory settings are probably correct, but just in case, this is how you do it. Here is a picture of what your correctly loaded tape gun should look like. Carefully snap the cover shut and you are ready for all those paper crafting projects! I hope this tutorial has been helpful!